The FT Group brings together some of the most trusted and reliable brands in business and financial information. In 2005 it increased profits by more than one-third and restored its world-famous pink newspaper to profit. Interactive Data Corporation, our 62%-owned financial information business, was once again the powerhouse behind this progress. Acquired by Pearson in 1995 to counter the cyclical swings of our advertising-funded business newspapers, IDC has been a model of rapid and consistent growth, increasing profits almost four-fold in only seven years to a record £80m. 2005 was also a year when our business newspapers began to emerge from a deep four-year business advertising recession. The Financial Times achieved a profit of £2m - an improvement of £14m on 2004 - as newspaper circulation stabilised and advertising revenues increased by 9%. Global advertising - booked for all print editions of the FT newspaper - was up more than 20%, and it now accounts for around half of all the FT's advertising. FT.com showed its importance to the FT's future, with over 3.2 million unique users, 84,000 paying subscribers and online advertising increasing by 27%. Through the year, the FT continued to expand its reach and influence around the world. The Global Capital Markets Survey named the FT the world's 'most important business read' and the European Opinion Leaders Survey named it Europe's leading, most credible and most respected title. 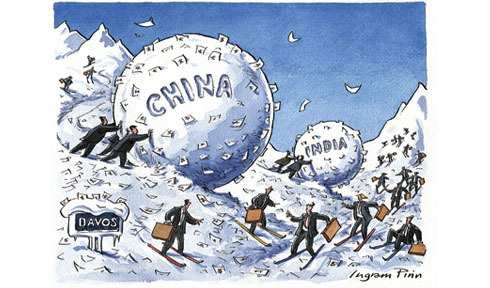 The FT's Asia edition, launched in 2003, achieved a circulation of over 36,400 in the second half of 2005 - a 14% increase year on year - and FTChinese.com logged 250,000 registered users and a formidable reputation among China's business elite. A similar story was told across the FT's network of leading national business titles. In France, Les Echos reached a circulation of 119,000. In Germany, FT Deutschland celebrated its fifth anniversary with a circulation of more than 100,000 copies. And The Economist, the world's best weekly newspaper, took its circulation past 1,000,000 for the first time in its history. Above: The FT continues to provide leaders in business, finance and politics with the best news, comment and analysis on the major international issues of the day. Our investment in the FT's Asia edition has coincided with intense interest in the rise of India and China, and the implications for international business, politics and economics. We've followed a very clear strategy for the FT Group: to take a UK business newspaper and make it the world's business newspaper; to take a once-a-day morning read and make it a relevant through-the-day business tool; to attract premium advertising by collecting a global audience of the people who run the world; and to construct a powerful, resilient financial information business in IDC that can prosper through the business cycle. That strategy is working, as the FT benefits from its unique position as a global source of news, comment and analysis.